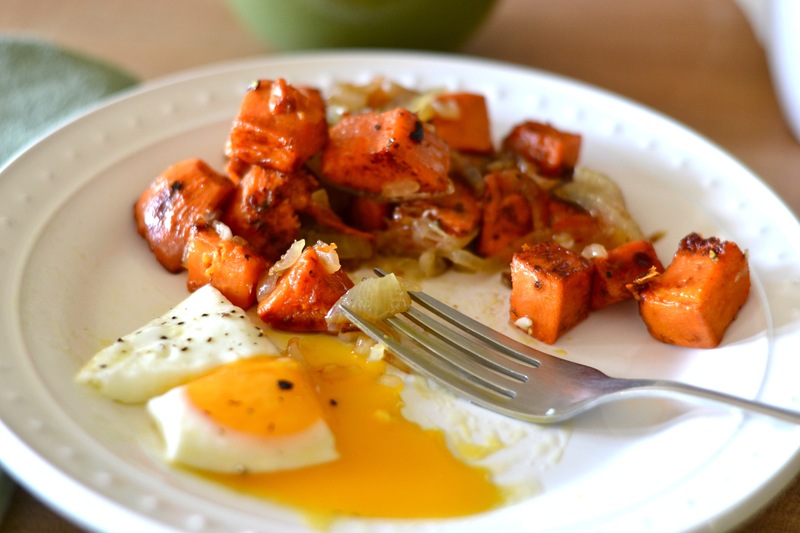 I’ve never cared for traditional hashbrowns, but I love hash–particularly hash made from sweet potatoes. You get all the yummy fried potato goodness but with a touch of sweetness and a lot more nutrition! 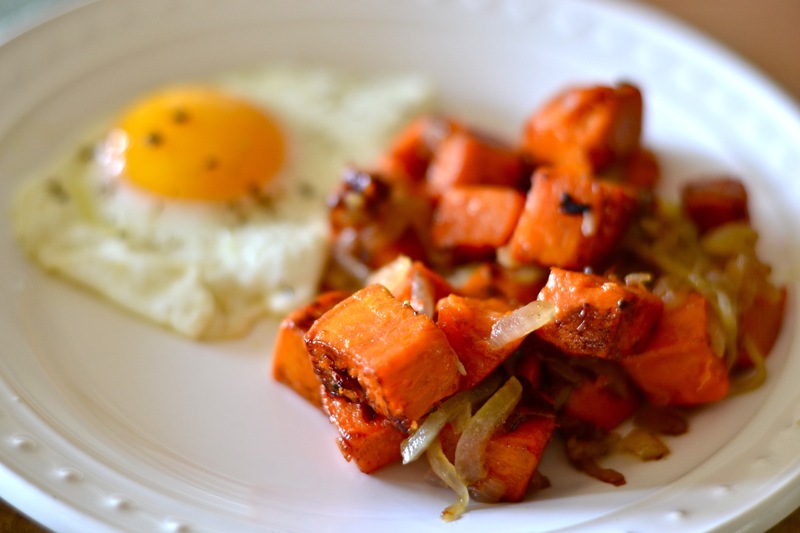 Sweet potato hash is one of my favorite breakfast eats. I’ve made it for a well-known celebrity, I’ve made it for brunch guests, and I make it for my family regularly. It’s also fast, easy and delicious because that’s how I like to cook! 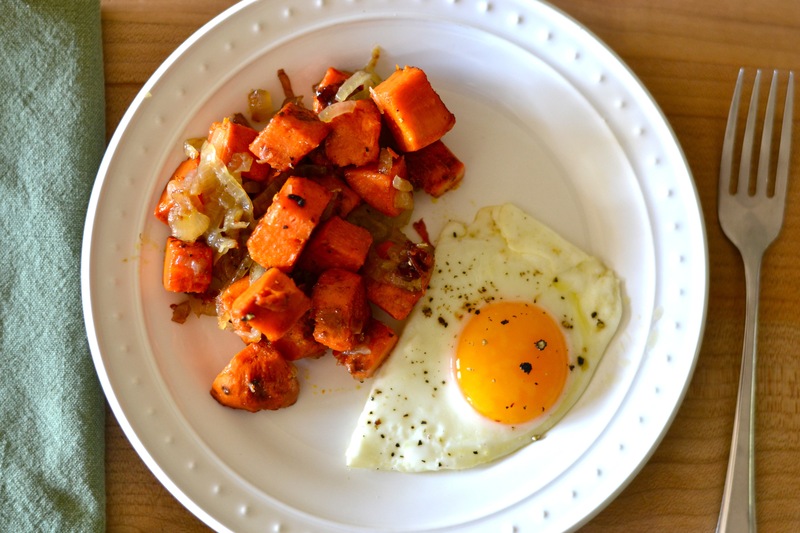 *There is a difference between sweet potatoes and yams, despite what grocery clerks might tell you, and you can use either in this dish. I like the texture of yams better, and I love the deep orange color. In a small cast-iron or other frying pan, melt the butter or ghee over medium heat. Add in the onions. Season with salt and pepper and stir occasionally until the pieces start to brown and carmelize. Meanwhile, in a large cast-iron or other frying pan, heat the olive oil over medium-high heat. Add the sweet potatoes and stir so the pieces are evenly coated with oil and evenly distributed in the pan. Add about 1/3 cup water, cover, and simmer for 8-10 minutes or until the sweet potatoes are just tender when pierced with a fork. Uncover and continue to cook until the sweet potato begins to brown. Add in the onions and continue to cook until everything begins carmelizing. Add salt and pepper to taste. Serve immediately. Serve with eggs, muffins, fresh fruit–whatever you like. This dish makes a great accompaniment to just about anything.